In what ways will your 4-year art education prepare you for life after high school? Every year I do an exit survey with graduating art students that have taken art since their freshman year. Below is the over-arching question that I ask my seniors. thinking outside the box, adding twists, and taking risks. These are the things I struggle with, but have pushed me to become a better student, artist and person. time management is the most important skill that I acquired. It is most helpful when you have a lot to do within a short amount of time. art has taught me patience as well as shown me that I can push myself to improve, even after I think I’m done. Through challenges, it has taught me to not be afraid to go outside my comfort zone. That is how you learn and grow. art has allowed me to express my creativity and grow as an artist. Now, my talents have developed and I am prepared to take art to the next level. Also, art has allowed me to try different mediums and showed me that may others exist. art provides a healthy outlet for self-expression. art has caused me to observe more minute details in all areas of life. seeing Mr. Juarez’s efforts to promote art within the school and community has given me an appreciation for local art events/exhibits. I’m also inspired to choose a career I will enjoy because being passionate about your work is important as shown by Mr. Juarez’s constant happiness doing something he loves. Congratulations to Kathryn Mason. She made the North Iowa Times. 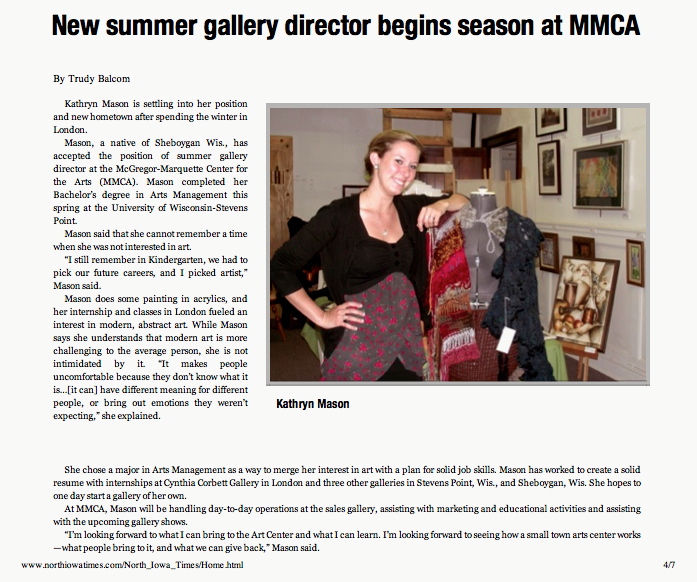 Kathryn is a 2009 graduate of Sheboygan North High School, a summer volunteer at the Frank Juarez Gallery, and a 2013 recent graduate of UW-Stevens Point. Image courtesy of the North Iowa Times.